Manitou - The Project X Fork is still in development, but so far it looks very good. The upside down design maximizes stiffness and minimizes weight. Now, Manitou is not the first to use this design - Hanebrink has done so for years, to name one. However, Manitou plans to bring the price down to that of a standard fork. The Project X will offer 100 mm of travel in a sub-3 pound fork, including the disc caliper (the design means that disc brakes are mandatory). 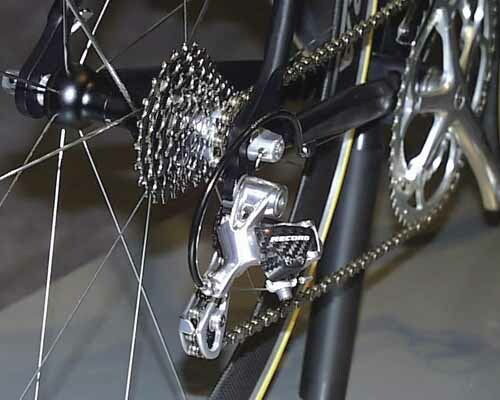 It will also offer a quick-release feature, something noticeably lacking on most disc-equipped bikes. Delivery is expected for the 2001 model year. Cervelo - This Canadian manufacturer of high-end triathlon and road bikes introduces the P3 - an upgrade to the popular P2 model. 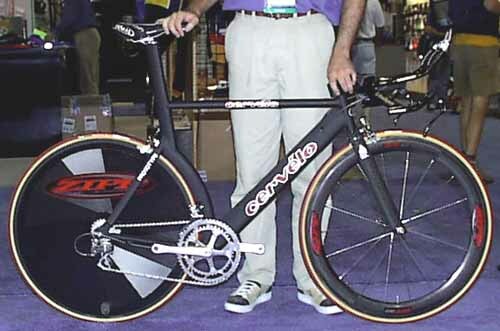 The major difference is the curved seat tube, which makes the frame even more aerodynamic. Even so, weight has dropped to approximately 3 pounds. Cervelo has cut their extended seat tube design, to meet incoming UCI regulations. 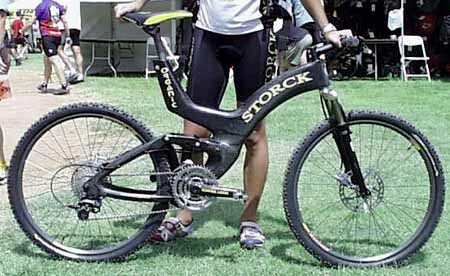 To do this, they have introduced a teardrop shaped seatpost. The price on the P3 has not increased over the P2 - $3000 Canadian for the frame/fork combo. Shimano - Lots of new stuff here. A few highlights include the new wheels (2 models, Ultegra and Dura Ace); a disc brake; new shoes; new groups (low end) and air-powered shifting. The wheels will sell for $315/pair US (Ultegra) and $420/pair US (Dura Ace). Weight ranges from 730 grams for a Dura Ace rear to 1010 grams for an Ultegra rear. 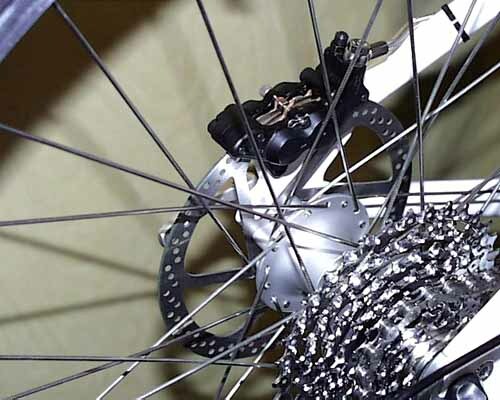 The 16 spoke, paired spoking pattern is rather unique, and Shimano claims that the lateral crossover design has exceptionally lateral rigidity. The deep section aero rims have a shot peened, hardened braking surface. Shimano was pointing out that the winner of the Race Across America (RAAM) rode a set for 3,000 miles without truing them at all. 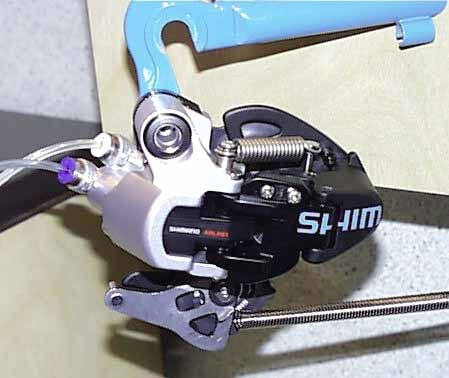 The disc brake has been designated as XT level, and Shimano claims similar weight to a V-brake. It is a 4 piston design, with stainless steel casing and rotor. Mineral oil is used in the hydraulics. The cost will be $300 US for a pair of calipers, plus 4100 US for a rear hub and $70 for a front. If you already have the hubs, don't worry - the bolt pattern is compatible with other current designs. The Airlines system has been promised for a couple of years now, and it looks like Shimano is finally ready to deliver. The system supplies 8 speed rear shifting through handlebar mounted buttons. Just tap the buttons to shift, with no effort or wait required. The system is designed for downhilling, and comes with its own rear derailleur and 7 speed cogset. The air supply is in a bottle that fits in a standard bottle cage, and that can be recharged by the owner. Shimano says that one bottle is good for about 400 shifts. Expected retail for the kit is $1600 US. Cannondale - Tons of new stuff here, including a single strut fork (the Lefty); a new thermoplastic frame design for the high-end Raven mountain bike series; CAAD5 mtb frames (tested by the racing team this past summer) that weigh only 3.4 pounds; and a working motorcycle - $7950 US, available early in the new year. Lance Armstrong made an autograph and Q&A answering appearance at the Trek booth - the line stretched halfway across the show floor. Phil Ligget was another celebrity dashing off signatures. 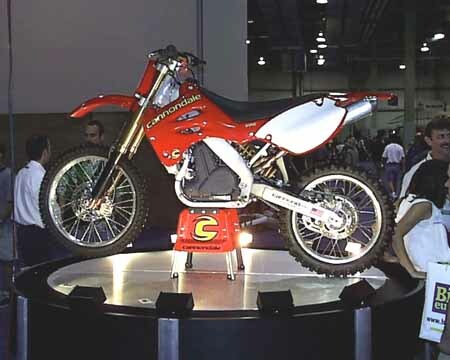 Best looking bikes at the show? As a line, the Rocky Mountains. As an individual bike, possibly the Norco VPS3 in a super white and red maple leaf paint job. In other Canadian news - Team Canada beat Shimano in the Interbike hockey championship, 6 to 5. The star was goalie Dave Hollands of Sugoi. Now they meet USA Midwest for the championship.